Covering your spare roll of toilet paper is much more visually appealing than leaving an extra roll sitting out undressed. This toilet tissue cover has straight sides and piping along the top edge. Using craft weight interfacing allows the fabric to stand up on its own; just remember to put a new roll under the cover when it gets used! Consider making a bathroom gift basket as a house or apartment warming gift. Everyone can use toilet paper, wipes and hand towels. The basket itself may end up making a great magazine holder. If you're not sure what color theme is going to be used, use neutral colors such as beige that can go with anything. Note: This pattern was designed for a double roll of toilet paper that measures 5" across and 4" high. 1/4 yard of 45" wide cotton weight fabric to match your bathroom. Cut one strip of fabric and one of interfacing, 5 1/2" by 17 5/8" (Using rotary cutting tools will help assure that you are cutting a true rectangle and accurate measurements. You may want to check the width of the brand you use. If it is more or less than the 4" that this cover was designed for, adjust the 5 1/2" measurement accordingly. Fuse interfacing to the fabric. 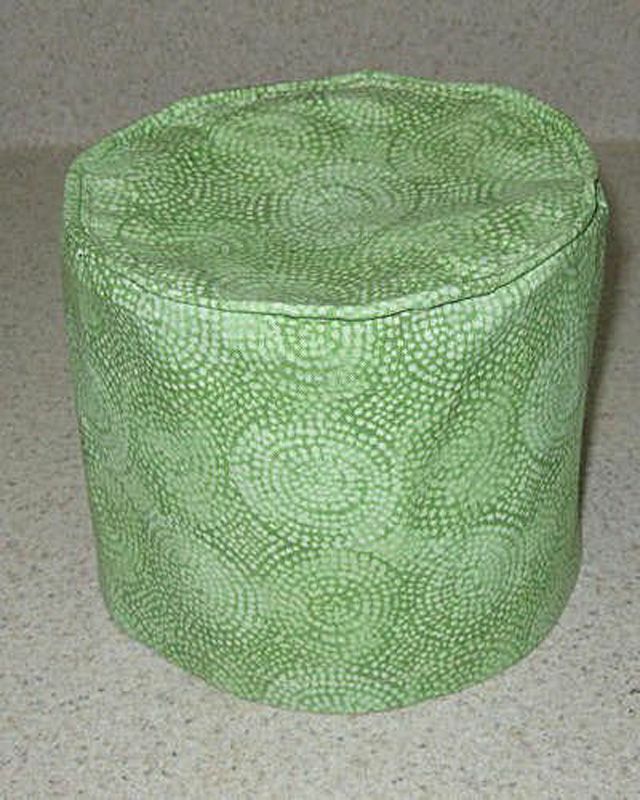 Sew the piping to the edge of the circle of fabric using a 1/2" seam allowance. Clip the seam allowance of the piping so that it will lay flat on the circle of fabric. Placing right sides together, bring the short sides of the rectangle together aligning the ends and edges. Pin in place and sew using a 1/2" seam allowance. Apply a seam finish to the seam allowance. Press the seam as it was sewn and then to one side. Sew a line of basting stitches 1/2" in from the unmarked edge of the side of the cover. Fold the fabric on the sewn line bringing wrong sides of the fabric together. Press well. Turn under the same amount again to enclose the raw edge. Sew the hem in place, sewing as close to the unattached top hem edge as possible. Fold the circle in half and in half again. Finger press and mark the folds in the seam allowance. Fold the tube in half and in half again. Finger press the folds on the top edge and mark the folds. With the right sides still inside, match the marks on the tube of fabric to the marks on the circle, by placing the circle right side to right side on the marked end of the tube. Pin the marks in place. Match the remaining edges, pinning them in place. Sew the top to the tube using a 1/2" seam allowance. Press the seam allowance inward onto the top circle. Top stitch around the top edge of the circle to sew the seam allowance into place. Press and place the roll of toilet tissue under the cover.